Alum Profile: Gil Perez-Abraham Jr. I was born in Baltimore but would consider Wichita my hometown. I was a Theatre and Economics double major, which became a Theatre major and Economics minor towards the end. What is your current professional work? This summer, I shot a beautiful feature called "Little Narwhal," a film about a young man who runs away from home to "find himself" in the city. Sound familiar? Currently, I am auditioning essentially as my career, and have majorly been focused on film and television work. Before the feature I had wrapped a nice recurring arc on Law and Order, SVU. Give us a brief summary of how you went from KU student to equity actor to having recurring television roles? During my sophomore year in college, I took the advice of one very important faculty member and auditioned for Eric Rosen at the Kansas City Repertory. He cast me in my first professional production as an understudy for Pippin's abrasive step-brother, as well as playing a combination of the complete male ensemble in a high-profile international production of the show. After that, I was fortunate to work quite a bit in Kansas City, commuting back and forth between KC and Lawrence during my junior year so that I could also take Dr. Hodges-Persely's audition techniques class, Paul Meier's advanced classics and Leslie Bennett's acting III course. The end of the year rounded out with the culmination of the American Heartland Theatre's historic run at the Crown Center, where I finally decided to join Equity (after Dr. Rosen had started my Membership trial at the Rep), performing a two-person comedy with the most wonderful actress I have ever worked with, Deb Bluford. After this I set my sites on NYC - I had also (on scholarship from the University Theatre) been backed to study at the Second City in Chicago, where I spent some time during this same junior year, and later at the William Esper Studio in NYC. I decided to finish the rest of my degree online, and took my AEA membership and $600 dollars to Manhattan. I had been working quite a bit in Kansas City and Chicago in commercials, so I was also a member of SAG-AFTRA by the time I got to New York. I got lucky, the first day in the city - I went to an Equity Principal Audition for an Off-Broadway production of Titus Andronicus and the next day, after a callback, was cast as the young prince Bassianus in a production with an incredibly cast. From there I worked quite a bit in the Off-Broadway circuit, doing plays all over the city - most notably at HERE Arts Center, The Barrow Group's June Havoc Theatre, Barefoot Theatre Co. (a sister company of The Labyrinth Theatre Co.) and a variety of new musicals. During this time, I have studied with Jennifer Monaco and Suzanne Esper - where I ended up playing the title role of "Manuel" in a hit new musical, Manuel Vs. The Statue of Liberty at the Signature Theatre Co. as part of NYMF in 2015. 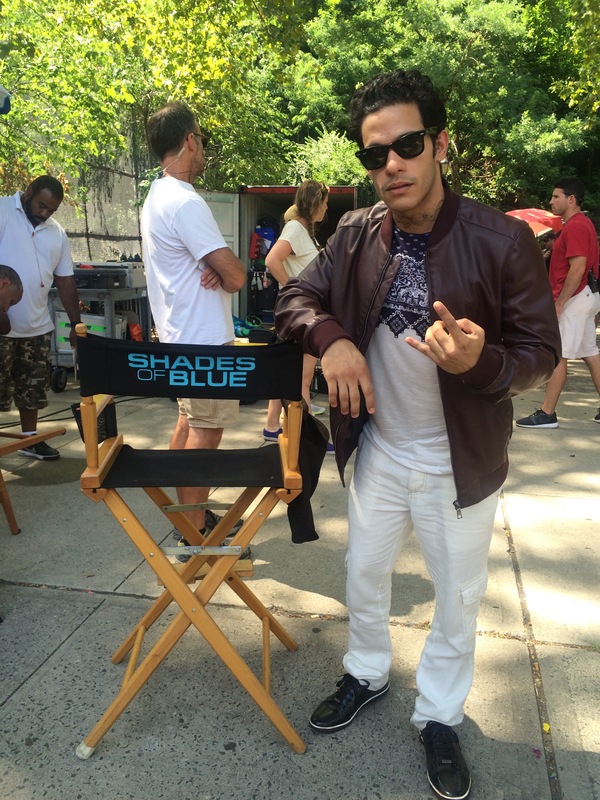 From there I could say that I have begun to be able try to hone my talents, leading to work on my first small role on Shades of Blue with Jennifer Lopez, my first guest star directed by Paolo Sorrentino on The Young Pope, and then from there I have been fortunate to be able to continue finding people who for some reason want to hire me. What has been your biggest challenge in the theatre industry so far? I think it comes down to time. Some people can show up and immediately pick up a lead in Book of Mormon or Wicked - and rightfully so, our training can prepare people for that. For others, like me, it takes a while to find your niche. If we think of other Kansas alum that work in the cities, for most it took some time to find exactly what their voice is and what sort of work they wanted to do -- to use myself as an example, I came in with big dreams in musical theatre but as soon as I realized what on-camera work could unravel it became my full attention. Having to hold part-time jobs to survive while doing what we have to do to get our inner artist some good is always a challenge, but finding your personal place in the hemisphere of it all, I think, is the biggest one. Give our current students some tips on handling rejection. You have to know what it is you came to do and why. If it is pipe dreams of becoming famous, that is going to make it really hard on your psyche and defeats the purpose of being an artist. Rejection is hard, of course, but easier to stomach when you are feeding "the itch", doing readings in the city -- or even having a couple of your close friends come over and dissect some new plays. There are always things to do that can help you get your talent out there that don't just hinge on getting or not getting a job. I handle rejection by putting it into more work, albeit free work, but I would hazard that most great work from most of our heroes probably didn't begin with huge paychecks attached. I would also say know your industry - you should know every critic and all current events if you are an actor. Helps bring some levity. What do you see as your biggest success in the theatre industry so far? I think, personally, it would be the world premiere of Holy Land, the Mohamad Kacimi play, at HERE Arts Center in Manhattan. Also at HERE, Heidi Rodewald's The Good Swimmer, an amazing grunge musical I was enthralled to be a small part of. Commercially, I would assume this film I just finished which is bound for Netflix or the arc on SVU. Tell us a bit about your self-care routine. What do you do to stay healthy, reduce stress, rejuvenate? I definitely go to the gym every day. Also meditate daily. I am finishing second year of drama school at the Esper Studio with Suzanne Esper and Jennifer Monaco, which is giving me more oxygen that most things ever could. Most importantly, I set out to create work every day - I am collaborating on producing a pilot as well as a play downtown. Sometimes we go to Central Park and put on scenes we've memorized for impromptu crowds. That is probably the most fun. I also make some music here and there, collaborating with two up and coming young artists, Shacar and Jhevere. How do you replenish your creativity? Where do you find creative inspiration? My teachers from home and my teachers here, our amazing history of plays and musicals, watching people's work, fueling when improvising or discussing our work with friends, taking long walks and turning my phone off. I don't use much tech right now (nothing wrong with it) precisely because I am focusing on finding that inspiration. It is around everywhere if we just allow it to happen to us. Oh, and of course, sometimes you just have to take that day off and lay in bed. Plenty of Netflix and Chill. And wine. All the wine. What advice/encouragement would you give young artists at KU today? DO IT! Just do it! Put on a short film. Put on a play. I remember when I was at KU, a certain number of us minorities felt that we didn't have enough representation of modern playwrights in our season that year (under old leadership), so with the help of the Student Board and faculty, we put on Jesus Hopped the 'A' Train at the Lawrence Arts Center. The play went over well, but most importantly, for most of us, it was the best performance experience we had while at the University Theatre! That same thing goes for the major markets. With so much saturation and an ease in exposure, why not just get with some friends, play $200 each, and rent a theatre for the weekend and do your favorite piece - or even better, a new piece? A one you've devised? I think the best thing we can do is always keep moving forward, remember the examples of the ones that came before us and keep our talent safe as much as we can. There are no excuses for being stuck at home wondering when your big break is going to come -- do the work for yourself. We all have personal reasons why we act, direct, write, dance--so just do it! What's your favorite KU memory? It has to be all those meetings with faculty. All those times I sat in front of Kathy Pryor and we would talk, she would listen and give advice. Same with Dr. Hodges-Perseley, Leslie Bennett and Paul Meier. They knew how much of an effect they had on me and they were so inspiring in how they handled me. I was an unruly student, for sure, I think some would say rebellious, but they all three would meet with me however much I asked because they knew I wanted to get everything I could from them. I have to say I wouldn't be who I am now without Paul saying, "just play it more cool," or Leslie allowing the exploration that she did in class, or Nicole's straight-up teaching - you either do the work and book it, or you don't--and that's on YOU! All three introduced us students to things that last a lifetime. To name one memory would be impossible.